It is estimated that as many as 49% of pregnant women snore, many of them having never snored before . This goes against the rule that women naturally snore less than men. In the general population, around 20% of women across all ages snore, with even fewer of child-bearing age doing so. Why does snoring increase during pregnancy? By the third trimester, your blood plasma volume is 40-50% more than it was before you were pregnant. On average, that is another liter and a quarter , or roughly 2 pints! This is necessary to meet the increased demands of growing a human. It is also to protect you from potential blood-loss in labor. In the meantime, this vast expansion in blood volume has some swelling effects on much of your body, including the areas responsible for snoring. Your airway becomes increasingly engorged with blood which causes it to narrow. This means the air passing through has more resistance. Additionally, you may notice that your nose has become quite congested. 42% of women in their third trimester have pregnancy-rhinitis, or nasal swelling . This can cause you to breathe through your mouth and snore as a result. Weight gain during pregnancy changes the way you breathe. As your uterus expands, it pushes upwards as well as outwards, meaning your diaphragm is pushed up too. This creates a lower residual volume in the lungs which can predispose your throat to obstruction and snoring . When pregnant, not only are you eating for two, you are also breathing for two! Pregnancy induces some subtle changes in the way you breathe: increasing the respiratory drive and the amount of air you breathe in an out within a given time. This can create negative pressures which lead to snoring . Should you be worried about snoring during pregnancy? There is some research out there to suggest that pregnant snorers are at greater risk of complications compared to pregnant women who don’t snore. But don’t panic. These are links, not direct causes and can often be associated with issues other than normal pregnancy-onset snoring. Pre-eclampsia – a condition characterized by high blood pressure and proteins in the urine. Having labor complications that necessitated a Caesarean section. Babies having a low birth weight. The important thing to note here is that these studies talk about “chronic snorers”. This refers to women who snored a lot before they were pregnant. If you are new to the snoring game since becoming pregnant, you needn’t worry. Pregnant women who snore shouldn’t be overly concerned about these findings. 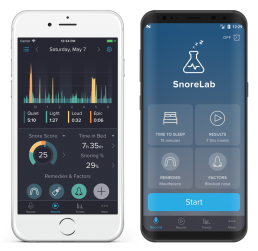 Every woman is different, and whilst these studies attempted to adjust their methods in order to look at snoring alone, other health factors are bound to have an effect. Indeed, being obese before pregnancy, having chronic conditions of the upper airway and smoking heighten women’s risk of snoring when pregnant. If these factors are applicable to you and your snoring has got much worse since becoming pregnant, it might be advisable to seek some guidance. If you are concerned about your snoring, experience excessive daytime tiredness or think you are having apneic events, consult your antenatal care provider. What can you do to stop pregnancy-induced snoring? The good news is that if you have started snoring since becoming pregnant, it is very likely that once you have given birth, the snoring will stop. Try nasal dilators – these are non-medicated so you needn’t worry about them being suitable for pregnant women. These simple devices either fit into your nostrils, or across the bridge of your nose. Here, they gently open your nasal passages and reduce snoring associated with a blocked nose. Sleep on your side – sleeping on your back is known to compress your airway and make snoring much worse. Regardless of snoring, side-sleeping is a good idea as you progress through pregnancy as it ensures adequate blood flow to your baby . Eat properly – gaining weight during pregnancy is inevitable but it’s important to not gain weight excessively. Careful consideration of your diet during pregnancy ensures the health of your baby and can keep off the excess weight that can lead to snoring. Use a humidifier – running a humidifier can reduce the congestion in your nasal passages, helping you breathe easier through your nose to reduce the likelihood of mouth breathing and snoring. The changes that happen during pregnancy can come thick and fast, and having the added annoyance of snoring seems a bit unfair. Thankfully, if you have started snoring only since being pregnant, you are extremely likely to stop once you have given birth. Whilst there is some science to suggest an increased chance of complications, don’t be too concerned if you find yourself snoring whilst pregnant, particularly if you are new to snoring. Try a few of our tips and if your snoring still causes problems, consult your antenatal care provider.